The evaporative cooling tower is by far the most environmentally friendly and cost-effective among the different types of cooling towers. It features a perfect combination of convenience, style, and functionality, making them popular not only in industrial structures but also in residential buildings. Learn more about it and its benefits here. Industrial machines and processes produce a great amount of heat. And in order to ensure efficient and non-stop operation, the excessive amount of heat must be eliminated and continuously released into the surrounding biosphere with the help of a cooling tower. Though each of these types has their own individual distinct features and designs, they all have a similar basic function which is to dissipate heat from the industrial operations or building system to the surrounding biosphere through the process of evaporation. Today, we are going to talk more about the evaporative cooling tower and why it is a better choice both for industrial and residential use. 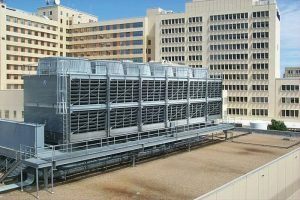 What is an evaporative cooling tower? An evaporative cooling tower, also commonly referred to as swamp coolers, is one of the primary types of cooling towers. Since it is relatively new on the market, not many people have known it yet. The evaporative cooling tower is by far the most environmentally friendly and cost-effective among the different types of cooling towers. It features a perfect combination of convenience, style, and functionality, making them popular not only in industrial structures but also in residential buildings. The evaporative coolers are available in different styles and applications. Though the evaporative cooling tower looks similar to a typical standard tower fan, it offers more functionality like ionic filtering, oscillation, and sleep timer. They also function in the same way as the other types of cooling towers but they look more stylish and are more compact than the others. You can even place them anywhere in a way that it is not conspicuous. 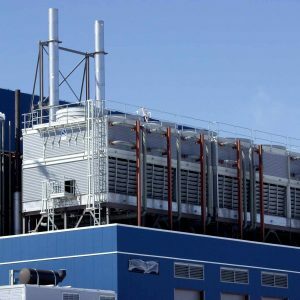 Why should you choose to use evaporative cooling towers? The process of an evaporative cooling system is quite simple. It does not rely on compressing and cooling refrigerants as a typical air conditioning system does. Instead, it uses the natural process of evaporation. Approximately, the cost of operating an evaporative cooling system is merely a quarter of that of a refrigerated air conditioning system. The evaporative cooling tower requires minimal maintenance. Primarily, maintenance only includes cleaning the cooling pad. The tower only has to be washed once every one or two years. As for repairs and replacements, the only parts that require repair whenever they are worn out are the water pump and the fan. Both of these parts can be purchased in minimal amount. And they are also very easy to install. You don’t even have to pay for expensive HVAC contractor services for cooling tower parts repair or replacement and system maintenance. The evaporative cooling tower does not consume as much electricity as other air conditioning systems do since it has a comparatively current draw, making them more energy efficient and cheaper to run. It does not also use any fan motor which typically consumes much energy. The evaporative cooling towers are designed to provide ease of use. It has simple, straightforward controls with no complicated settings, making it easy to use. It also doesn’t use any compressor which often causes power spikes when you turn it on. The evaporative cooling tower does not require any special, expensive and toxic refrigerants like ammonia. Instead, it uses clean water for its fluid. This makes it safer for you and the environment. It does not only clean the air by providing enough humidity, but it also helps eliminate the contaminants in the air which deplete the ozone layer. The evaporative cooling tower offers a quiet operation. It only operates at merely 50 dBA or below. Just like any other swamp cooling towers, the evaporative cooling tower also comes with amazing convenient features such as air ionizer, 3 speeds, oscillation, and a sleep timer. Evaporative cooling tower installation is relatively easier and less costly as opposed to that of the central refrigerated air conditioning. It does not include complicated processes like installing drains or hoses. You just have to plug it in, add the required amount of water to the reservoir, and you are good to go. Installation cost is also generally just half the price or less than that of the refrigerated air conditioning. The evaporative cooling towers are highly effective in cooling the water and keeping the building or industrial machinery free from exceedingly hot water. For residential buildings, it also offers enough humidification especially in dry climates, thus avoiding dryness while providing residents with a healthier, safer, and more comfortable indoor environment. The evaporative cooling system relies on the same principle as the natural process of evaporation. It functions the same way that our body uses to stay cool. Like for instance, when we are sweating, the water or our sweat will be converted from liquid phase to gaseous state through evaporation. Through the process, the excess heat content of our body will be drawn out as well, thus, keeping us cool. Another great example is when you come out of the pool and you are under the heat of the sun. After a few minutes, you will notice that you slowly get dried up. This is because the when heat is applied to a liquid, the liquid will change into gaseous form. The same principle is being used by evaporative cooling towers to provide the necessary cooling for building systems and machinery. There must be enough amount of heat to be applied to the water in order for the process of evaporation to take effect. This way, instead of turning the water into gaseous form, it will be the heat that will be discharged into the air, thus making the water cooler.